If you like your SUVs to be true to the "Utility" in "Sport Utility Vehicle," while still being small enough to comfortably maneuver in a city, the Forester may be the vehicle for you. With a low starting price, standard AWD, proven reliability, more towing power than many others in its class and great visibility all around, there's certainly a lot to love. All of Subaru's vehicles, including my model the Forester, has the highest ratings for safety and they are all all wheel drive allowing drivers to travel just about anywhere despite the weather/road conditions without having to mess with switching from 4 wheel drive to 2 wheel drive. All wheel drive makes it a breeze to drive and is more efficient. I love how my vehicle is all wheel drive and allows me to travel on just about any road despite the conditions. I also love how roomy it is as I can fit 3 kids in the back with one in a car seat and another in a booster seat. I also love the fact that my vehicle is one of the safest vehicles made. That is very important. Any complaints I have would be that you need to buy snow tires for newer versions of the Forester to get up gravel roads covered in ice. My dad has a older Forester and he can travel on icy roads without a problem. Subaru changed the engine of the Forester and now it doesn't have as much power as the older ones did. That is my only complaint about my vehicle. Handles great in rain and snow. 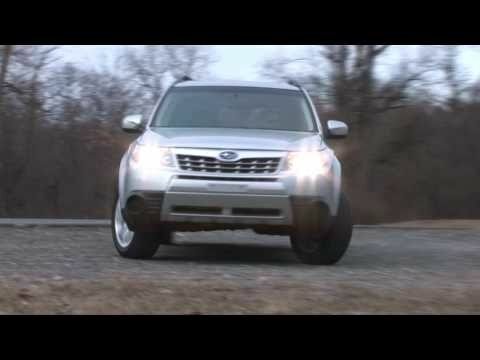 The symmetrical all-wheel drive makes for great handling all the time! I drive mine pretty high miles, and you can tell in the idling sounds when it is in need of an oil change. Be mindful of this! Leg room in 2 of the 3 back seats is great, however there is a hump in the floor in the middle, leaving the person in the middle seat having to decide whether to put both legs on one side with another passenger, or put one foot on either side. . . One with each other passenger. Great storage room in the back, and the seats lay flat for more hauling space, or even catching a nap back there if you needed! We absolutely love the AWD and that we don't have to worry about getting stuck! We love the AWD of the car - we don't have to worry about getting stuck in the snow we have regularly in Utah. I dislike that in my personal vehicle the rear windows are jammed and do not roll down. We tried to get it fixed during the warranty time, but of course "we didn't have any issues so we can't fix something we couldn't see ourselves." I'm hoping the rear seats will be big enough to fit three carseats in since we have twins coming in December and I would be so sad if we couldn't fit them and had to get a different car! SUBARU IS RECALLING CERTAIN MODEL YEAR 2009-2012 FORESTER VEHICLES MANUFACTURED FROM NOVEMBER 26, 2007, THROUGH MARCH 13, 2012. THE AUTOMATIC LOCKING RETRACTOR in the SEAT BELT ASSEMBLIES LOCATED IN THE REAR CENTER SEATING OF THE AFFECTED VEHICLES DO NOT MEET LOCKABILITY REQUIREMENTS AND FAIL TO COMPLY WITH FEDERAL MOTOR VEHICLE SAFETY STANDARD NO. 208, ?OCCUPANT CRASH PROTECTION.? SPECIFICALLY, THE ASSEMBLIES MAY NOT PERMIT PROPER INSTALLATION AND SECURE ATTACHMENT OF A CHILD RESTRAINT IN THAT SEATING POSITION. SUBARU WILL NOTIFY OWNERS, AND DEALERS WILL REPLACE THE REAR CENTER SEAT BELT ASSEMBLY WITH A NEWLY MODIFIED AUTOMATIC LOCKING RETRACTOR, FREE OF CHARGE. THE SAFETY RECALL IS EXPECTED TO BEGIN ON OR BEFORE APRIL 13, 2012. OWNERS MAY CONTACT SUBARU AT 1-800-782-2783.